C Webstore Presents Need another size? Size Medium Large Fits most womens 8-12 The 138cm Kilo wakeboard by Joyride wakeboards engineered to set the future standard in performance wakeboarding. By adjusting the radius on the edge and tips on the wake board, Joyride created a sharp parting line which enables smooth or aggressive cuts. Joyride has open cores to allow the water to flow more naturally after contact. The center-line neutral (flat spot) keeps water flowing toward the tip while weight distribution is on the tail. This causes the tail to slide out more smoothly and under control. 4 molded fins laying 17" long and set 3/8" deep (no drag). Each Channel is drawn out for straight tracking which cuts into the water holding the edge better. After landing, the board straightens out fast and accurate. The double-barrel tide-ways combined with the surface area causes butter soft landings. This board can be ridden fins or finless(fins not included). System boot now comes with Liquid Force s new Lycra/Neoprene toe piece, which is softer and more flexible than previous versions. Equipped with the C3 footbed - canted, cupped and contoured - the Liquid Force Element provides an extremely comfortable and shock-free, women-specific ride. Most importantly, you can share this comfort-conscious mid-level boot with all your friends. So step into your Liquid Force Element Womens Wakeboard Boots, kit up with your Liquid Force wakeboard, and enter into your element. PRODUCT DETAILS OTHER FEATURES New Lycra/Neoprene Toe and Heel Pieces - Soft and flexible to accommodate the size range you are looking for. Super easy to get into. C3 EVA Footbed - Canted for proper alignment. Contoured for premium arch support. Comfortable, pain-free riding all day. Molded EVA/Lycra Heel Piece - Molded heel locks the back of your leg into riding position, providing support, response and superior hold. Lycra provides a soft and comfortable heel that is easy on your toe. Padded Inner Cuff - Padded for comfort and leg-friendly support. Side-Mounted Hardware - Allows liner to wrap up and around your foot, letting the boot feel more like your favorite pair of shoes and less like ill-fitting wakeboard bindings of the past. System - Adjust every 2 degrees. Locks down for 360 degrees of hold down. Reacts with your movements, transferring the energy directly to the board. Please do research before ordering. NOS Brand new bindings may have minor cosmetic flaw. Feedback is very important to us! Addresses only (lower 48 states), excluding P. 1,000's more in stock. Get images that make Supersized seem small. Tailor your auctions with Auctiva's. 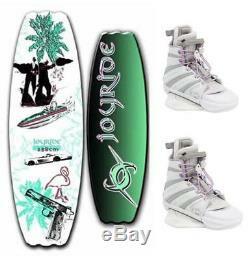 The item "$700 Liquid Force Joyride Wakeboard + Element Bindings Womens 8-12 L Package A43" is in sale since Tuesday, July 24, 2018. This item is in the category "Sporting Goods\Water Sports\Wakeboarding & Waterskiing\Wakeboards". The seller is "winter-warehouse" and is located in USA. This item can be shipped to United States, Canada.